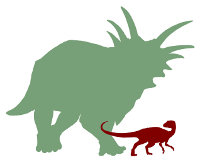 The Open Dinosaur Project was founded to involve scientists and the public alike in developing a comprehensive database of dinosaur limb bone measurements, to investigate questions of dinosaur function and evolution. We have three major goals:1) do good science; 2) do this science in the most open way possible; and 3) allow anyone who is interested to participate. And by anyone, we mean anyone! We do not care about your education, geographic location, age, or previous background with paleontology. The only requirement for joining us is that you share the goals of our project and are willing to help out in the efforts. Want to sign up? Email project head Andy Farke (andrew.farke@gmail.com), and welcome aboard! I am student of anthropology of the Federal University of Amazon in Benjamin Constant-AM – Brazil. The archeology and the paleontology are two areas that it fascinates me. Check out this page for more information. We’re winding down data entry now, but there is still lots of work to do!